1. Dickens was the second oldest of eight children. He was the father of ten children. What Dickens can teach us: Yes, you can pursue your passion and have a family. Nobody has time to write, unless you make time to write. 2. When Charles was twelve, his father was sentenced to debtors’ prison. Charles had to go to work ten-hour days in a shoe polish factory. What Dickens can teach us: Use your experiences in life, good or bad, not only to know what to write, but why to write. Through his storytelling, Dickens championed the struggles of the poor. Decide on a vision for your writing. 3. In the sometimes cruel conditions of the factory, Dickens experienced loneliness and despair at a young age, but he realized that these can illustrate not only the depths of human nature, but the heights of kindness and redemption. What Dickens can teach us: It is the character of a man that makes a memorable character, and everyone, at the core, is motivated by one deep-rooted universal desire–to be loved. What Dickens can teach us: End each scene, and each chapter with a cliffhanger to keep your reader turning pages. And, with electronic publishing’s new gateway to readers, I believe the serialization style that Dickens’ popularized will experience a Renaissance. Like Dickens, writers today can get feedback from their readers that can inspire their stories as they are created. 5. 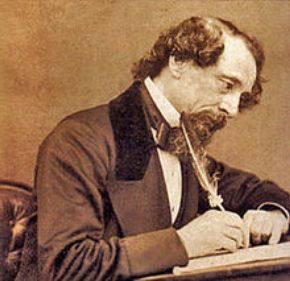 Dickens died of a stroke in 1870, at the age of 58. He wrote novels, novellas, short stories, and non-fiction. The 200th anniversary of his birthday is being celebrated around the world. What Dickens can teach us: You can make a difference, but don’t let time rob you of the chance. And don’t necessarily limit yourself to one style of publication. Write with a vision. Write now. Wonderful write! I agree wholeheartedly!! Thanks. One great aspect to writing a blog is that it forces me to think about what writing teaches us. Thanks, Jack. It wasn’t too late for Scrooge to realize how he should be spending his life, so it’s not too late for us! Clever and bang on. Well done, Pamela! Thanks, Christina! I hope it helps my fellow writers. I love Dickens writing because it was his art and sometimes I believe that the art is sacrificed on the altar of commercialism. Not everything he wrote I find wonderful but he wrote stories that someone would find wonderful. Thanks, David. That’s why I enjoy reading and writing. We can have different reactions, but always learn something new. I’m new at your blog, but after reading this post I think I’ll become a regular reader. Thank you for such an inspiration! I’m so glad to have you as a regular reader. Thank you for your inspiration! And I learned something about Dickens, too! Thanks for the great read. I’m glad you enjoyed it. It’s wonderful when people and ideas teach us about writing and that, in turn, teaches us about people and ideas. The middle school kids in my carpool all chose A Chrismas Carol as their favorite Dickens story. Me, too! Thanks for sharing. Dickens is definitely one of the great masters…In spite of that, I agree with you, there’s a lot he can teach to us, the little ones! But vision? Yes, you’re absolutely right, one should have vision. But that’s going beyond genre, going into literary literature! One has to make a big, big effort for that unless you were born…Dickens! So true. I am struggling with my writing today, feeling tired and uninspired to maintain that big effort to create a worthwhile story. I believe Dickens had a natural talent, but his life experiences, his drive to share his vision, and, no doubt, a dedication to effort is what made him a master.